Abia State Governor, Dr Okezie Ikpeazu, has filed an appeal against Monday’s judgment of a Federal High Court in Abuja which removed him from ‎office as governor. In the notice of appeal filed by Chief Adegboyega Awomolo, SAN, the governor raised five grounds of appeal upon which he asked the Court of Appeal to set aside the judgment and orders of the high court. Ikepazu also faulted the judge when he held that he did not pay his tax for the years 2011, 2012 and 2013, as when due, when he was a public officer whose tax deduction was under Pay As You Earn (PAYE) scheme where tax deductions were from the source of his monthly salary by the tax authorities who issued all the tax receipts and certificates. 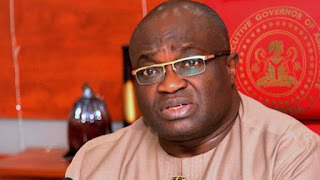 Ikpeazu said that the plaintiff Dr Samson Udechukwu Ogah was not a staff of the Abia Board of Internal Revenue and did not any staff of the board to testify ‎that the tax certificates were forged.